An example of Breitling's commitment to crafting instruments for professional, this special edition of the Professional series is born from Breitling's partnership with the RAF and is limited to only 100 pieces. This COSC-certified chronometer features large military-styled numerals and a digital indicator to enhance readability and performance. The RAF crest features at the 9 o'clock mark to further signify its status as a unique piece. Breitling Professional Limited RAF Edition Titanium Watch is rated 5.0 out of 5 by 1. 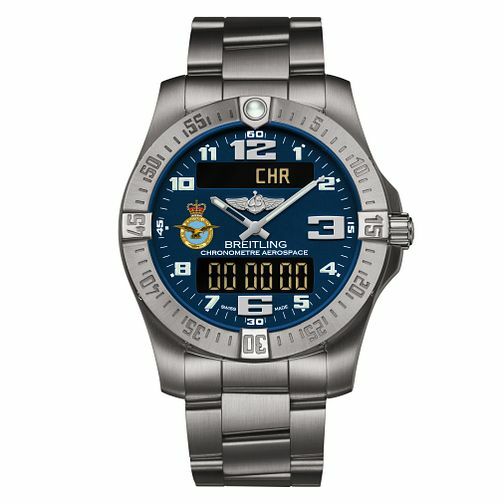 Rated 5 out of 5 by Anonymous from RAF100 A really well built watch and with the breitling reputation for excellence, add to the exclusivity of being a limited edition of only 100 to celebrate the RAF centenary. The strap and case are titanium so very light to wear. The face is striking and with the RAF crest at the 9 o'clock position makes this a watch worth cherishing.